I write for Figure Four Fotos, featuring live action reporting of regional events in Northern California. Contact me at figurefourfotos@gmail.com or at Facebook Figure Four Fotos. Follow us on Facebook to make sure you know about upcoming fights we'll be featuring live, get the results and see great fight action photography. We were at the Crane Pavilion in Point Richmond covering the action at Rocktagon Rock-N-Rage 14. If you want to make sure you see the photos as they are uploaded, click “Sign me up” at the bottom this page. Or you can go to Figure Four Fotos on Facebook and “Like” us. Rocktagon states Neal will be defending his Rocktagon featherweight championship belt. The 25 year-old Neal is 4 – 0. He won his last fight by KO in the 1st round, and the remaining fights by decision. He comes from Hayward and lists his fight team as Crispim BJJ. 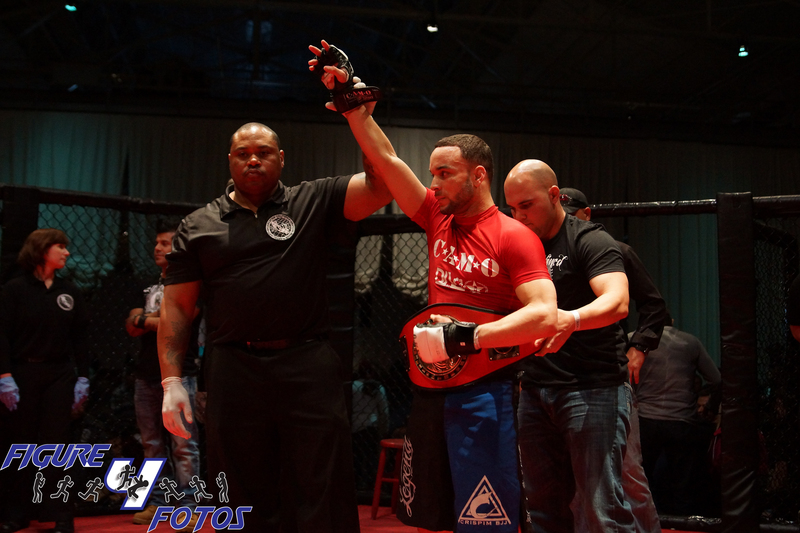 The 5′ 7″ and 27 year-old Perez is 2 – 1 – 1, his 2 wins were by unanimous decisions and his loss was by submission. He received a draw for his last fight He fights out of Gilroy and lists his fight team as Antdawg’s USH. Round 1 – Some ranging strikes. Perez throws a left hook but Neal counters with a straight right. Neal lands a solid punch and knocks Perez down. Neal follows to the mat but Perez is out and the ref stops the fight! Result: Neal by KO at 1:21 in the 1st round. Rocktagon states this fight is for their light heavyweight belt, although Camo lists this as a welterweight fight. The 5′ 11″ and 22 year-old Wallace is 2 – 1, with 1 win by submission in the 2nd round and 1 by KO in the 1st round. The loss was by unanimous decision at the Slugfest promotion in Oakland on 10/22/11 (click to see our photos of this event). Wallace is out of Oakdale and lists his team as (Oakdale MMA) Last Stand Fight Team. The 5′ 9″ and 23 year-old Bryson has not fought in a Camo event. According to Rocktagon, Bryson is a Marine veteran with military combatives experience and is a two-time Greco-Roman wrestling champion (they don’t say what championship). Bryson is from Santa Maria and lists his association as SMAC (Does anyone know whether this refers to a gym or to a Marine Corps assignment, as in “Specialist in Martial Arts Conditioning?”). Round 1 – Bryson lands some heavy combos, chasing Wallace across the cage. Wallace grabs underhooks and takes him down, takes his back, flattens him out and throws left fists at the side of Bryson’s head. Wallace has Bryson’s arm trapped with his leg, throws some hard hooks to the side of Bryson’s head. Bryson isn’t able to protect his head. The ref stops the fight. Result: Wallace by TKO at 0:43 of the 1st round. JJ Okanovich (0 – 1 ) fought at Born to Fight (see our photos here) vs. Israel Delgado (0 – 0) – welterweight fight. Round 1 – Delgado grabs a Muay Thai clinch and throws him to the ground. He stands up and grabs Okanovich’s foot landing some hard kicks to the thighs. Okanovich stands up and shoots on Delgado, grabbing a double-leg. Okanovich ends up in Delgado’s full guard and Delgado gets a leg triangle but loses it. The round ends up with Delgado on top. Round 2 – Delgado lands a straight right and another straight right knocking Okanovich to the mat. Okanovich grabs double-legs and takes Delgado down inpo full guard. Delgado reaches for a leg triangle but misses. Okanovich moves into side control against the fence and tries to mount his back, slips, then gets back mount. Then Delgado rolls and Okanovich takes bull mount. Okanovich switches to and armbar. Delgado taps with seconds to go in the round. Result: Delgado by armbar at 1:58 in the 3rd round. Round 1 – Palmer lands a good combo and kick. Martin responds by knocking him down. Palmer scrambles but Martin takes him down. Martin stands up and lands some heavy right hooks, knocks him down and the ref stops the fight. Result: Martin by TKO at 0:44 in the 1st round. Cynthia Calvillo (0 – 0) vs. Stefanie Harrison (0 – 0). Round 1 – They start fast with Calvillo taking Harrison down into half guard then transitioning into full mount. She’s landing a lot of heavy blows. Harrison is having trouble blocking the blows. Some hammer fists some straight rights and lefts. Harrison gives up her back. Calvillo flattens her out, Harrison rolls again as Calvillo lands huge combos. Round 2 – They mix up fists. Calvillo tries for a single leg. Misses. Harrison is looking gassed. Calvillo is looking a little tired too. They both throw wild punches but Calvillo looks like she’s a more accurate and crisper striker. Round 3 – Harrison is moving okay but she’s throwing weak punch. Calvillo lands a good right to her chin and swarms on her. She’s out on her feet as Calvillo chases her across the ring landing strike upon strike. The ref stops the fight. Result: Calvillo by KO at 1:16 in the 3rd round. Isaiah Batin-Gonzalez (0 – 1) vs. Shawn McMullin (0 – 0) featherweight fight. Round 1 – McMullin lands a left jab. Gonzalez lands a nice high right kick. Then lands a left kick but McMullin shoots and takes him down. Gonzalez mounts but McMullin regains half guard then sweeps and grabs a guillotine but can’t hold on. They stand and McMullin shoots taking Gonzalez down. Gonzalez scrambles up but McMullin grabs a leg and tosses him down. They stand up and Gonzalez lands some good knees. Round 2 – McMullin attempts to shoot but Gonzalez stuffs it they clinch and Gonzalez lands a bunch of hard knees. McMullin does a hip toss and takes Gonzalez down into half guard and grabs a guillotine. He has it in pretty tight. Gonzalez rolls him over and it looks like McMullin is going to loose it. Gonzalez struggles into half guard. Gonzalez escapes and takes McMullin’s back and the round ends. Round 3 – Gonzalez lands some good combinations and McMullin looks hurt. He tries to shoot but Gonzalez lands some heavy strikes as they go to the ground. The ref stops it. Result: Gonzalez by TKO at 0:26 in the 3rd round. Mefi Monterroso (0 – 1) vs. Michael Gall (1 – 3) – flyweight fight. Round 1 – Nothing much happening. A few glancing blows by both. Monterroso shoots for a double leg and pushes Gall against the fence. They swap postions several times. Gall tries a trip but Monterroso ends up on top in side control. Monterroso takes full mount but Gall escapes out the back. Monterroso tries to kick but Gall counters with a solid right that sets Monterroso back on his heels. The round ends. Round 2 – Starts the same as Round 1. Monterroso tries some round house combos band Gall counters with a left jab. More circling. Gall attempts to shoot and Monterroso grabs a standing guillotine. He takes him down into his guard but loses the guillotine. The round ends with Gall in Monterroso’s guard. Round 3 – Starts fast. Monterroso takes Gall down into side control. Gall gains half guard then full guard. Gall has Monterroso locked down so he’s not doing much from the top. Monterroso’s having trouble getting an arm loose to strike. Monterroso stacks Gall up against the fence and the round ends before he can do anything. Result: Monterroso by unanimous decision. No scores announced. Gustavo Farias (0 – 0) vs. Ahmed Abdelaziz (0 – 1) – lightweight fight. Round 1 – Mostly ranging strikes initially. Abdelaziz lands a solid right and Farias is knocked down or trips. Abdelaziz pounces and lands some heavy strikes from side control. Abdelaziz transitions to back control and locks in an RNC. Result: Abdelaziz by RNC at 0:53 of the 1st round. Jaime Rios (1 – 0) vs. Jeremy Murphy (2 – 0) – featherweight fight. Round 1 – Rios lands a left fist right away and takes Murphy down. Rios lands shots to the ribs from the top, postures up. Rios grabs a double leg and takes him down. Murphy gets a guillotine but Rios escapes. They’re on their feet exchanging punches. Rios takes blue down into full guard. Murphy reaches for an armbar and Murphy backs out. They swing and the round ends. Round 2 – Rios takes Murphy down into side control. Murphy gains half guard. Both are landing shots to the ribs. Rios isn’t doing much. Murphy has under hooks. Rios postures up and lands a couple shots from the top. Rios is more successful now, landing more shots from the top. The round ends. Round 3 – They’re sparring and Rios seems to have better range but nothing hard landed. Rios has Murphy backing up continuously. A few kicks and spinning back fists attempted but nothing lands. It appears Rios is out boxing Summers . Result: Unanimous decision for Rios. Couldn’t hear the scores. Justin Davis (0 – 2) vs. Brian Summers (0 – 1) – middleweight fight. Round 1 – Davis shoots right away and takes him down into full guard to land fists but Summers scrambles to his feet. Davis takes Summers down and lands some ground and pound. Summers tries to stand up but Davis transitions to his back. Davis turns into full guard, then sweeps into Summers’ full guard. End of round. Round 2 – Davis starts with an attempted spinning back kick but Summers blocks and they grapple. Summers grabs guillotine and drops to the ground but Davis gets out. Davis lands a glancing right. They both land outide kicks. Some swinging and Davis gets a solid left. Summers grabs a double leg and appears hurt. Davis rushes and takes Summers down. The round ends but blue looks like he wants to throw in the towel. Result: Davis by failure of opponent to answer the bell. Michael Ortega (4-0) vs. Timothy Peterson (1 – 0) – cruiserweight fight. Round 1 – Peterson shoots and after some up and down he eventually takes Ortega down. But Ortega gets a few short rights in the process. Ortega is able to stand up and they start swinging. Peterson lands a hard right to Ortega’s chin and he goes down. The ref stops the fight. Result: Peterson by TKO at 1:55 in the first round.